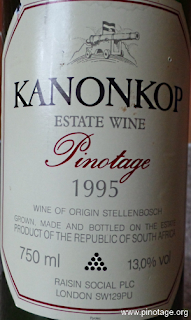 My Wine of the Month for May is Kanonkop Pinotage 1995. Twenty years old and at peak perfection, this is a superb wine with a perfect balance of restrained fruits and soft tannins with a long sweet finish. 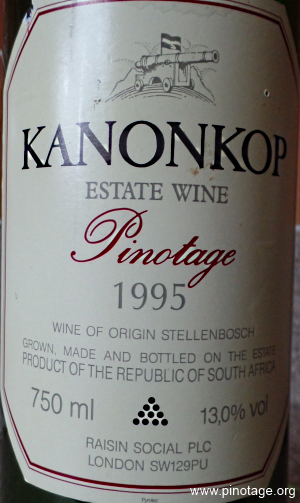 Irritatingly the cork broke, a recurring issue with old Kanonkops – I said back in 2007, after a 1999 cork crumbled, that would drink up my remaining 1995s aft. Well, I forgot so I was able to enjoy this superb wine – my last of this vintage. But I’d have preferred it without cork debris in the first glass. 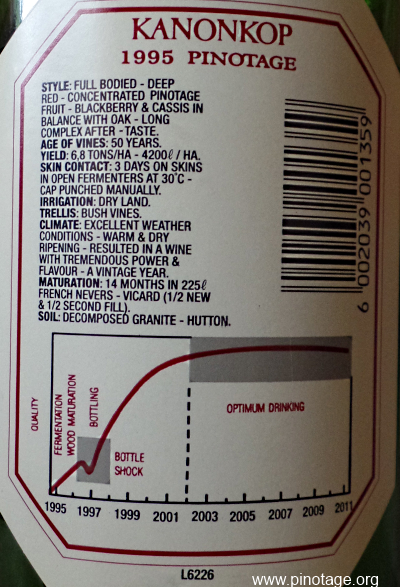 Note the pleasingly uncluttered back label, today’s vintages are now graffitied with health and allergy warnings. I don't know when I bought this, but it was before 2005 and has an unnamed shop's price label showing I paid £11. Just launched is Abraham and the Heretics, a new Pinotage created by Richard Kelley MW for importer Dreyfus Ashby intended for independent stores where it should retail at under £10. 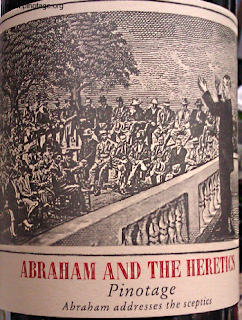 Abraham is A I Perold, creator of Pinotage and the front represents him addressing a group of Pinotage sceptics while the back label quotes Helen Keller “The heresy of one age becomes the orthodoxy of the next”. I tasted the first vintage, 2013 and found a most approachable and drinkable wine with soft ripe juicy fruits, feels light bodied although has 14% abv. Richard (above) says “Abraham and the Heretics is something of a tongue-in-cheek challenge to Pinotage non-believers to accept the variety into their vinous lives”. 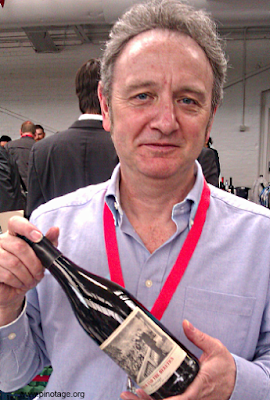 2014 sees a 16% increase over 2013 in the amount of Pinotage crushed in California and that's a 400% increase from the amount crushed in 1997, the first year records appeared, according to Jon Clements' Pinotage US website which has created some nifty graphs. Topper's Mountain Pinotage featured an my Wine of the Month for December 2104, but I didn't manage to get to the vineyard myself. But John Lewis did and features Topper's Mountain owner Mark Kirkby and winemaker Mike Hayes in his article for Australia's Newcastle Herald.